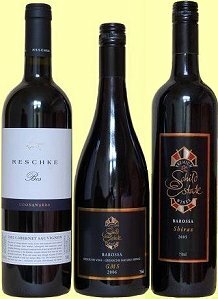 Schild and Reschke are two new Australian names on the UK wine shelves, yet the two estates have totted up 150 years of farming and winemaking history between them. 100 years ago, the Reschke family’s estate was used for cattle grazing, but the best plots have gradually been converted to vineyards. Now, the wines are made by Peter Douglas, Chief Winemaker at Wynns for 16 years. Schild Estate in the Barossa has 50 years of vine growing history, and has recently been attracting attention, including a 93-point rating from the Wine Spectator for its Shiraz tasted below. Both estates are now being brought into the UK by H&H Bancroft. Made from dry-farmed 70-year-old vines, this blend of 50% Grenache with the balance of Mataro (Mourvèdre) and Syrah, spent five months in older French and American oak. It has a terrifically meaty nose, with an animal edge to stewed prune and compote notes, and hints of pepper and spice. On the palate there’s a massive rush of super-sweet berry fruit that floods across the mouth, with ripe blackcurrant and raspberry giving an intense, almost ripasso fruit character. Everything is given an edge by big, fairly rustic and chewy tannins and a tangy cherry acidity. This becomes quite savoury in the finish, and a food-friendly personality emerges in a concentrated wine with a plenty going on. Bottled in screwcap. £9.75, H&H Bancroft. 88/100. Schild Estate’s Barossa Shiraz comes from the Angus Brae vineyard, and this 2005 gained 93-points from Wine Spectator. Aged in a combination of new American and French oak barrels, it has a dense, peppery nose, with a touch of grilled meat and a certain minerality. There is white pepper too, and abundant black cherry fruit starts to emerge. On the palate this is instantly savoury and yet fruity, with leathery cedar and spice notes combining with black fruits, and a softening suggestion of vanilla in the background. The fruit is really dense and ripe on the mid-palate, though a decisive stripe of liquoricy tannin adds a finely honed edge. Juicy cherry acidity keeps this quite fresh, and the medium-bodied, savoury character pushes through into a long, spicy and peppery finish. Bottled in screwcap. £11.50, H&H Bancroft. 90/100. The ‘Bos’ in the title of this wine is a playful reference to the estate’s cattle farming heritage, being Latin for ‘bull’. This 100% Coonawarra Shiraz is matured in small oak barrels, 10% new and American, 90% used and French. It has a lovely grilled meat savouriness on the nose, with a powerful core of black fruits and plenty of meaty, sinewy depth. On the palate there is a soaring sweetness of fruit, with rich, ripe, mouth-filling black fruits flooding the palate. The tannins are ripe and svelte, with the oak adding a mocha coffee grip, and acidity is very nicely judged, not ruffling the velvety character of this wine, but adding just enough bite. A big wine (but not huge at 13.5% ABV), with layers of sweet fruit and good structure. £14.25, H&H Bancroft. 91/100.